A lot of people I meet are interested in taking a beautiful photo of their child. And on those days when you'd like to shoot some pictures but it's too cold to head out, fear not. Today I'm sharing my favorite indoor setup that you can replicate at home. You don’t need a backdrop or anything fancy to create a beautiful photograph. For me, I get nice, soft light in my bedroom in the morning. The light that filters in through the windows is not very bright or harsh. There are two windows along the wall and I can control the light with the blinds to increase or decrease the amount of light. If you don’t have blinds or sheers on your window(s), tape or pin 1-2 white sheers up to help soften or minimize the light coming in (if it is too bright). Here is a photograph of the setup I like to use. Notice there is some clutter and not a lot of space so your home doesn’t have to be perfect. 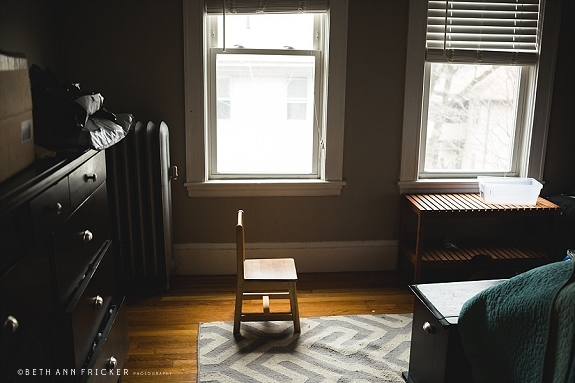 I place the chair where I want my kids to sit still. The attention span of my children is short but they will cooperate in small doses. 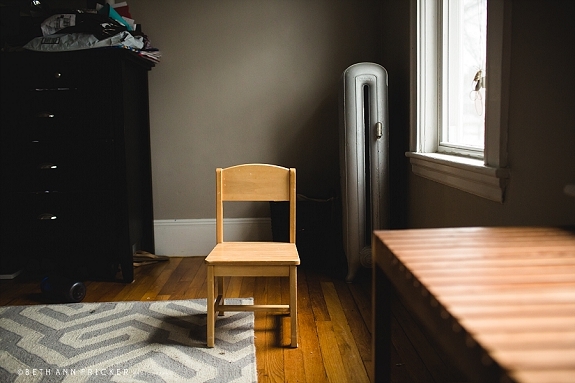 If a chair doesn’t work try taping an “X” on the ground so the child know where to stand. Adjust the amount of light hitting the child by turning them towards and/or away from the window. Ideally, the child will be at a 45 degree angles from the window. This will create a nice shadow on the face. Here is what my view looks like from the camera. For your photograph to look sharp, do your best to focus on the eyes or the eye closest to you. Below are what a few of my photographs look like from this setup. I didn’t do anything but convert these to black and white. I’d love to see your result! Share a link in the comments below (if you have photos posted on your own website), or upload them to the Boston Mamas Facebook page. Beth Ann Fricker is a lifestyle photographer who loves documenting the emotional connection between people and their environment. Her business, BAF Photography, specializes in photographing newborns and families. She also teaches introductory to photography classes to parents in the Boston area.